While this is old new, I could not find any mention of it on the forum and think it is important because of the insane behavior of this particular young illegal alien. 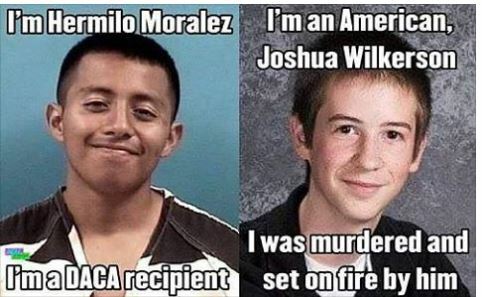 Illegal alien Hermilo Moralez murdered and burned citizen Joshua Wilkerson, thus showing us just how criminal some illegal aliens can be. Wilkerson's partially burned remains were discovered in a Fort Bend County field, where his body had been dumped with his hands and feet bound. Horrific! It is that we are humans, otherwise i would suggest the illegal alien to get a sentence as what he did to his victim. We need a huge wall. Every time I read articles like this i feel the wall need to be taller! Oh no!! Not the wall!! These are the lovely people that are crossing that border! Who needs to immigrate here legally?????? Note the sarcasm. It's completely disgusting and cannot STAND when hardworking citizens stand for these people. Get them out.